For those who love to drive and explore for themselves, Germany is a paradise. There are many scenic drives and themed roads for the car enthusiast to traverse which will take you past medieval castles, quaint villages and beautifully unspoiled country side which you would not be able to appreciate as fully if you had done these routes in a tour. The following are some of the best drives that are available for you to do. This 261 mile long drive through Bavaria is known as the Romantic Road for a reason. Starting from the Franconia wine country it leads you right up to the fairy tale castle of Neuschwanstein that sits in the foothills of the German Alps. Along the way you’ll come across picturesque towns complete with city walls lying in the pretty Bavarian countryside as well as hidden monasteries and idealistic hotels that you can spend a night in. One particular stop off you should take is Wurzburg which is home to the UNESCO World Heritage listed Residence Palace and its fantastic wines. For those with a passion for history, the German Castle Road will not disappoint. This route is littered with more than 70 castles and palaces that you can stop off and admire. Along the 625 mile long road you encounter everything from romantic ruins, perfectly reserved castle museums and even the occasional castle hotel which are well worth spending a night in. The road starts in Mannheim and takes you all the way across the country to Prague in the Czech Republic meaning it is a sizable trip. This is Germany’s oldest scenic drive and starts in the southwest of the country. This 50 miles long route will take you through Germany’s second largest wine growing region and finally comes to an end at the French border. Along the way you will be able to stop off at some local harvest festivals, charming wine villages and colourful vineyards. If you are thinking of doing any of these drives by yourself or with your family then you will need to rent a car in Germany and there are some great offers you can find if you shop around. This trip is the best for families as it offers plenty of activities for children as well as adults. 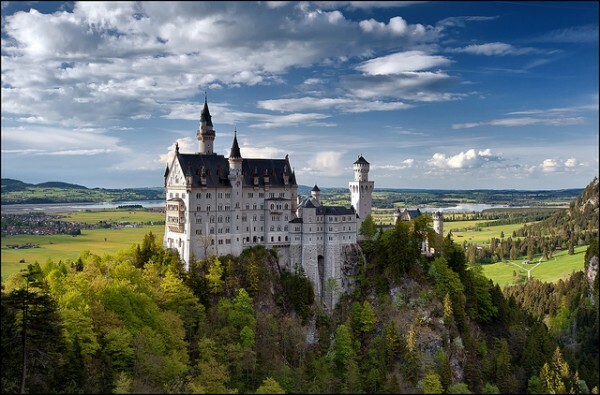 Along this drive you can explore many of your favourite fairy tales from the past such as the country of the Brothers Grimm. The road connects the towns, land marks and landscapes that were the inspiration for other famous fairy tales. Stop off and hike in the forest of Little Red Riding Hood, visit the castle of sleeping beauty or climb up to the top of the tower where Rapunzel let her hair down for her rescuer. The towns you will encounter along the road all offer something for the children to break up the trip from puppet shows, parades, concerts and lovely statues of your favourite characters.